Fantastic Holiday Lodge available for hire on the 5 star rated, Devon Hills Holiday Park. Well equipped 2 bedroom lodge in the heart of the "English Riviera". Double bedroom with en-suite and walk in dressing room and 1 twin room ensures that the lodge sleeps 4 in comfort. It has a family bathroom with shower, wash basin and toilet and a separate w/c with wash basin. The lodge has quality fittings and fixtures throughout. Open plan lounge/diner with sofas and a relaxing armchair, focal fireplace, 32inch tv, free view, DVD player, dining table and chairs. Fully functional kitchen with, fan oven, gas hob, microwave and integrated fridge/freezer. The lounge has double patio doors which open onto a large, raised, South west facing sundeck with patio furniture and BBQ. Perfect for relaxing after a long day discovering the sights of the local area. Iron, ironing board, hair dryer and vacuum cleaner are all supplied. Travel cot and high chair available on request. Bed linen, towels, gas and electricity are all included in the price of your stay with us and the lodge is personally cleaned in between bookings by myself and my daughter. All visitors will benefit from free access to the on site facilities (detailed below), complimentary welcome pack and WiFi access. The lodge is situated a 2 min walk from the on-site indoor, heated pool and the onsite bar restaurant ' The Blagdon Inn'. The Blagdon Inn has a range of local beers and ciders, a fantastic menu which caters for all tastes, and holds regular carvery and 'all you can eat' curry evenings. We are just a couple of miles from large, local attractions, such as, Paignton Zoo, Paignton Pier, Dartmouth Steam Railway and Splashdown Water Park and there are numerous beaches in the close area including Paignton, Goodrington, and many more. All of these attractions are easily accessible by car or bus. We cater for midweek, weekend, or longer stays. Please enquire if you have specific dates/duration in mind. Scenic Walks, Watersports, Golf Course, Amusements, Pubs/Clubs, Theme Park, Takeaways, Fishing, Historical Attractions. Additional Info: Pub/Club, Tennis Court, Indoor Pool, Restaurant, indoor, heated swimming pool, gym, sauna, steam, room and treatment room. Children's activities are available but need to be booked in person and may incur additional cost. Passes for the site facilities are included in your booking. Had a much needed short break at Devon Hills, site facilities were excellent especially the swimming pool and gym, also utilised the Blagdon Inn which was very handy to walk to, the lodge was clean and comfortable and much nicer to stay in than a caravan, the site was quite and peaceful, will visit again in the future. Thank you for such a wonderful holiday. The lodge is spacious with everything provided including bedding and towels. 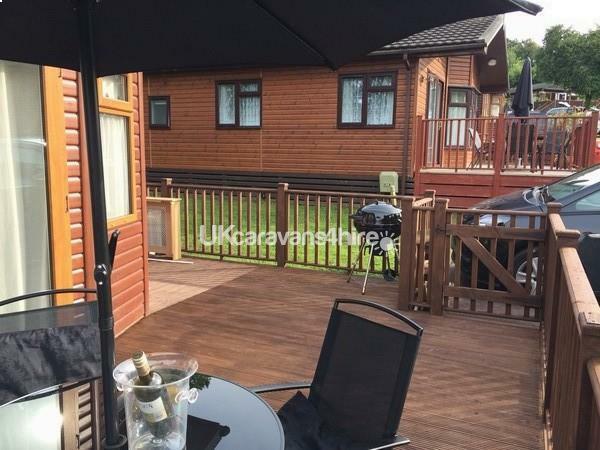 It’s situated on a quiet part of the park and has a very large decking area with patio furniture. The owners were quick to respond to email and text to help with the booking process and answer anything else to do with the holiday. We were so happy with everything we are looking to return in the autumn. Just returned home from a short break at this well situated lodge on a immaculate site. We attended a wedding locally with the reception at the Blagdon Inn and was delighted to find this gem so close. Joe is an attentive owner who communicates with his guests in a friendly manner. All enquiries & information are very quickly answered. The whole experience could not have been better. Thank you Joe & Denise. Hi Terry, I'm glad you enjoyed the stay. I hope you had a great time at the wedding. If you are ever in the area again we would love to have you as a guest. Been before, back again, that says it all and we hope to book again later in the year. Many thanks for a cosy home from home on a well kept site . Our dog loves the field for exercise but we lost his ball in the brambles on the last day, better bring two next time. Thanks again Joe. Liz, once again it’s been a pleasure and thank you for your excellent review. Can’t wait to welcome you all back. Thank you Tanya for the lovely comments. We look forward to welcoming you back. Thank you for your lovely comments we hope to welcome you all back in the future. We welcomed the chance for a midweek late booking . Being on the level with a small ramp the Lodge suited us perfectly as an older couple with limited mobility, as did the gated veranda for our dog. There was a great exercise field near by which he loved. There was a nice touch of a small Christmas tree and a garland around the mantle piece. With the fire on the lounge was very cosy. We hardly used the kitchen but it was well equipped. There was good leg room in the double bedroom along with an en-suite. A surprise of a dressing area also. Comfortable beds with a good tog of duvet for these winter nights. Our stay was short but we hope to visit again soon in the New Year. Merry Christmas Joseph & Denise with Best Wishes. Really enjoyable stay and a warm welcoming Lodge. Park is very well maintained and the staff really friendly. Thank you for your lovely comments. We look forward to welcoming you back in the future. The lodge was very well furnished and tastefully decorated throughout, spotlessly clean and tidy. It contained every convenience that you would need. I was especially impressed with just the small things that you wouldn't expect like tea, coffee, sugar and hand wash liquid. There was even a fresh pint of milk in the fridge for us. The site is kept spotless with friendly staff always with a wave. We took our dog and it was very dog friendly with 2 exercise fields. Already a fan of this region, I wouldn't hesitate to book with Joe again. Had a brilliant holiday here, we come to Devon every year and decided to stay here this year, the site is really nice very quiet and the staff onsite were all very friendly, perfectly situated to explore all the local areas and attractions. The lodge itself was immaculate cleaned to a very high standard, well equipped they even provide towels, tea towels and bed linen which is a very nice change, beds were comfortable. The owners were very polite in all communication, would 100% stay here again, we have just booked for next year. Thanks for a great holiday nutbrown family.